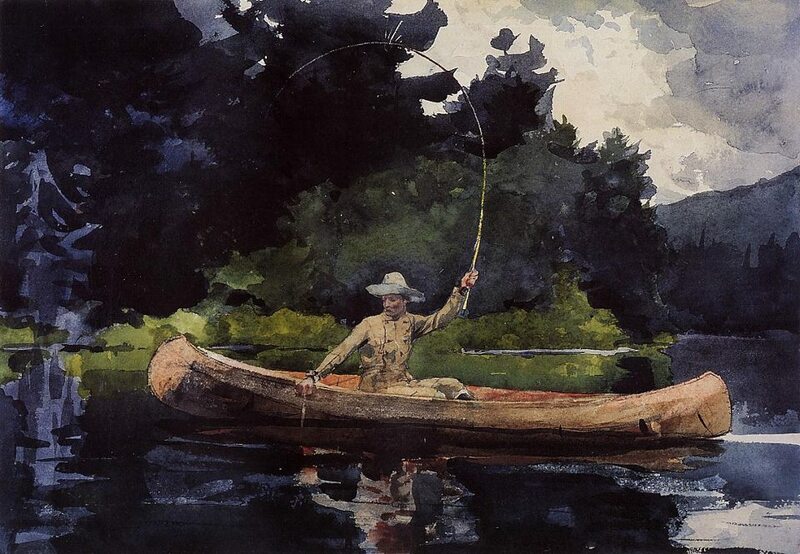 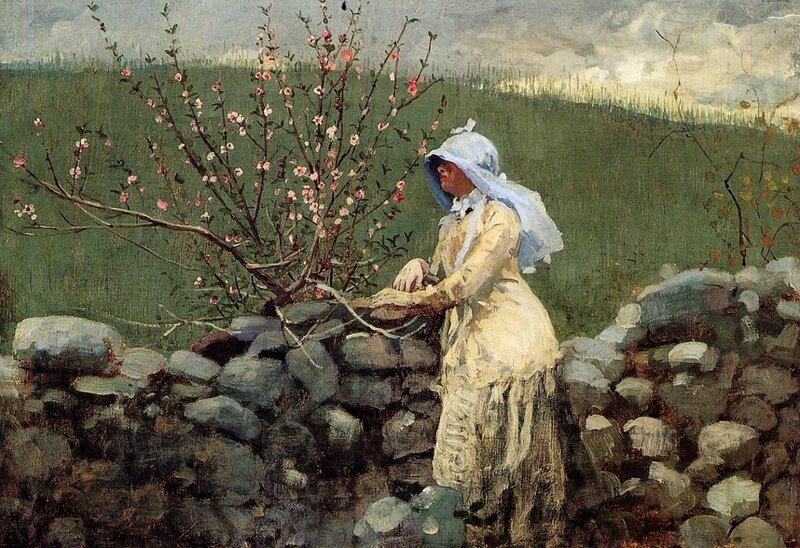 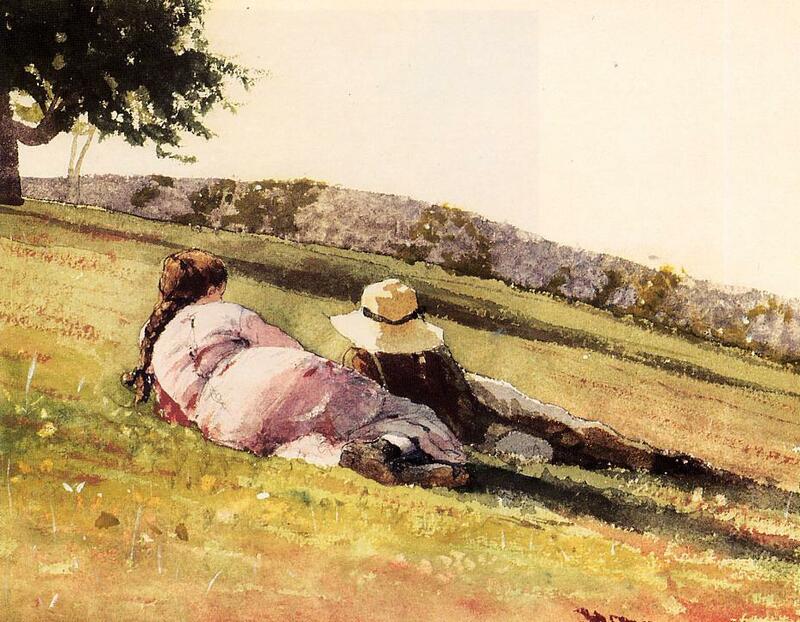 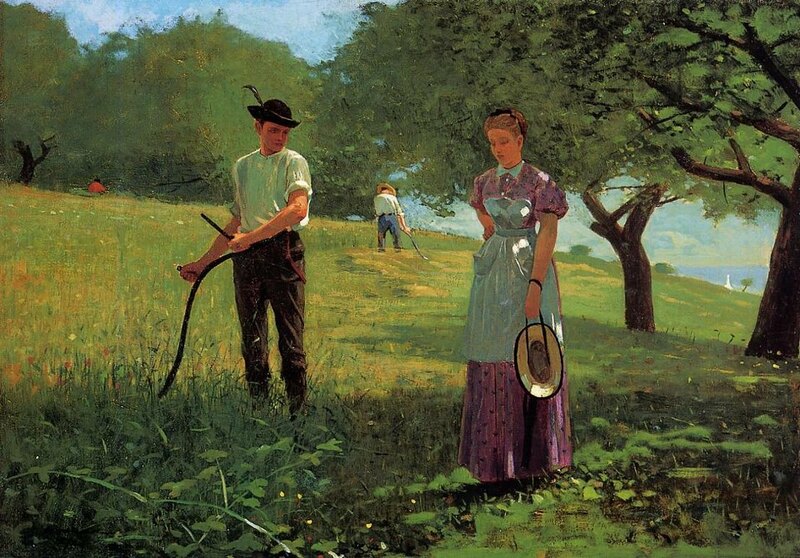 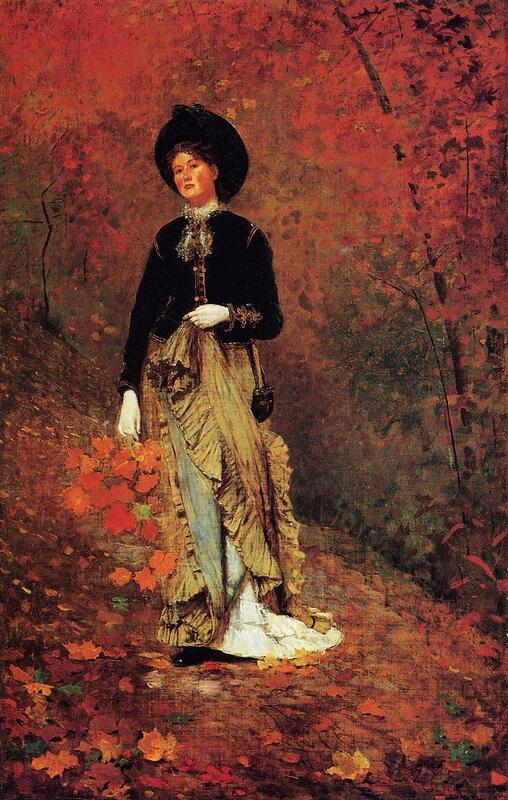 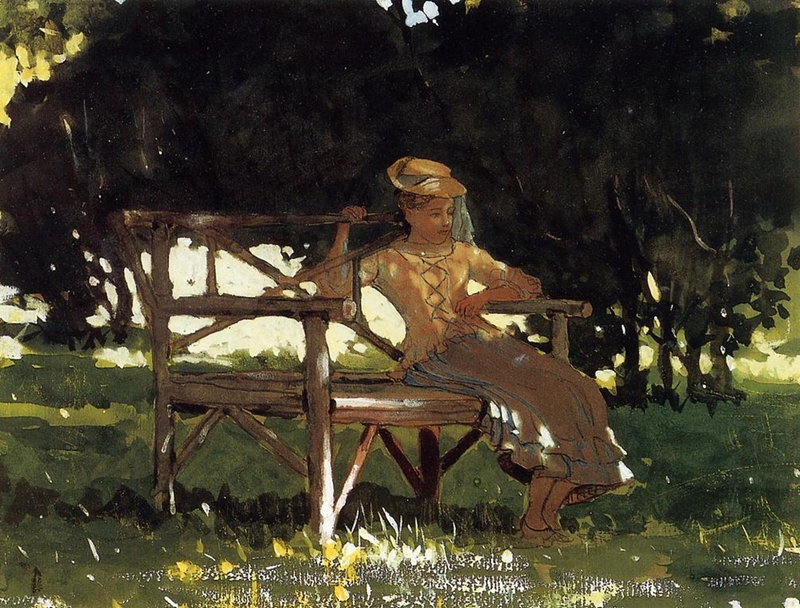 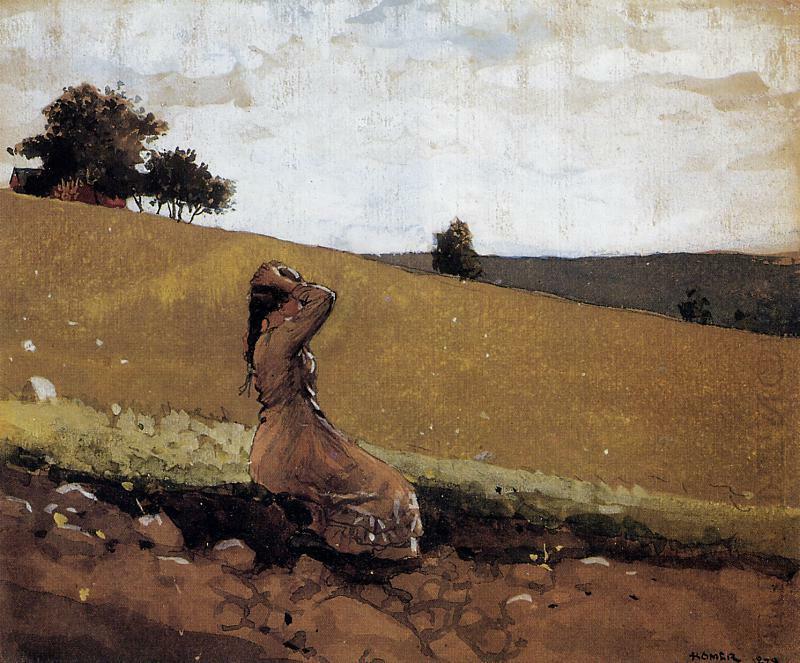 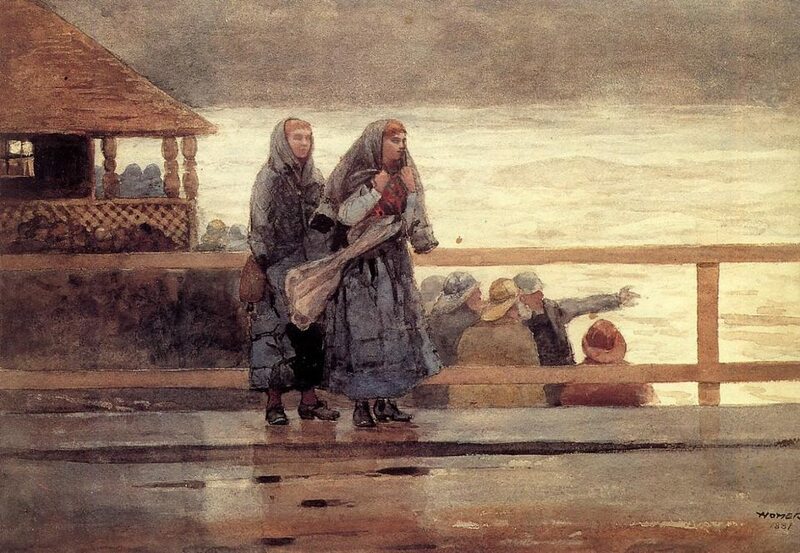 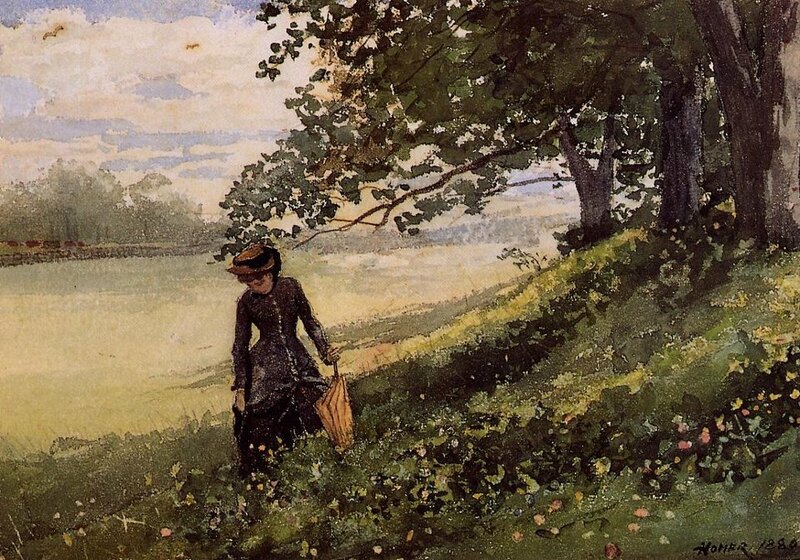 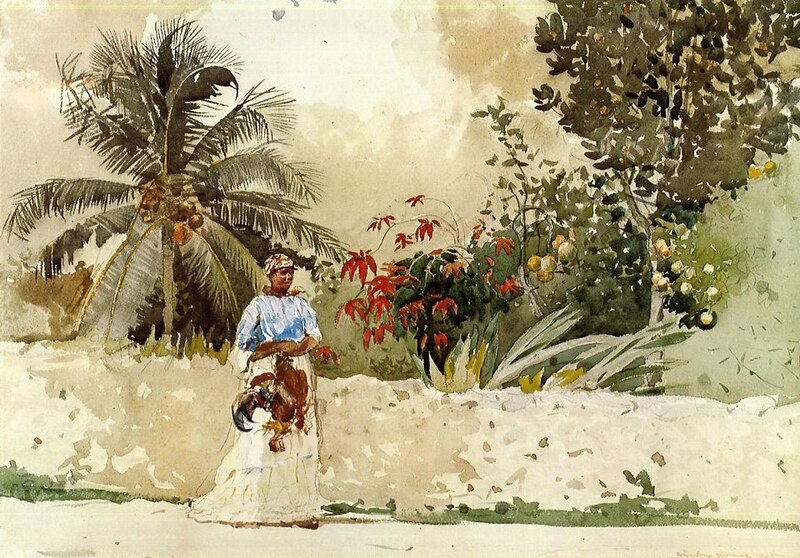 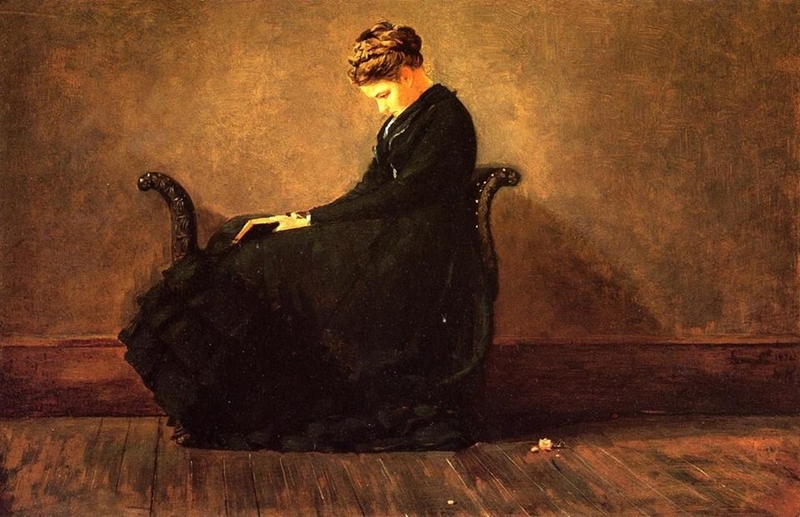 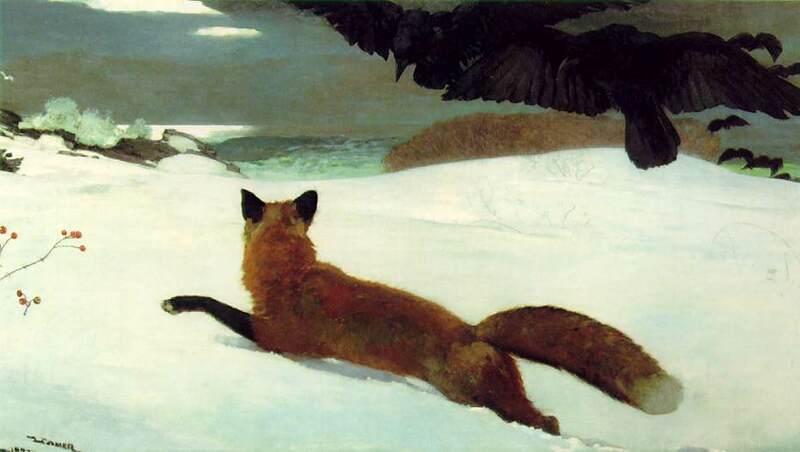 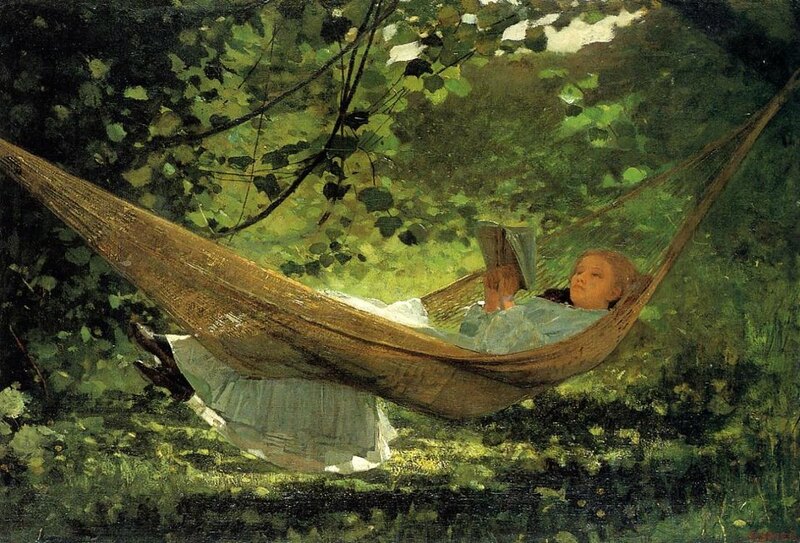 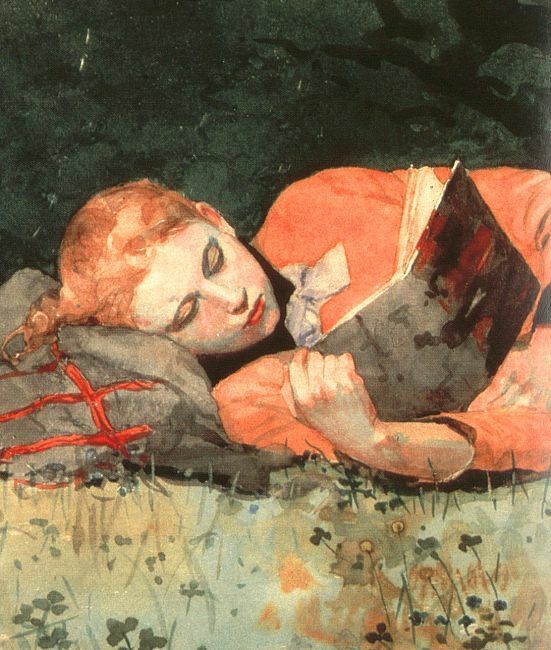 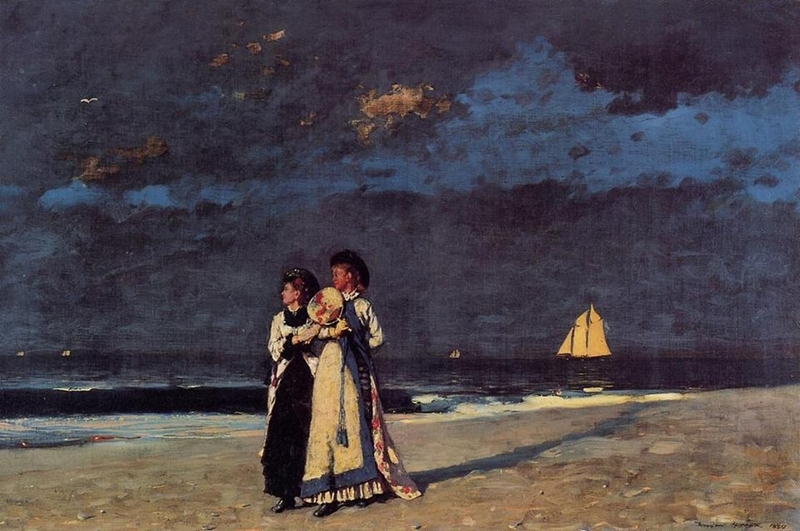 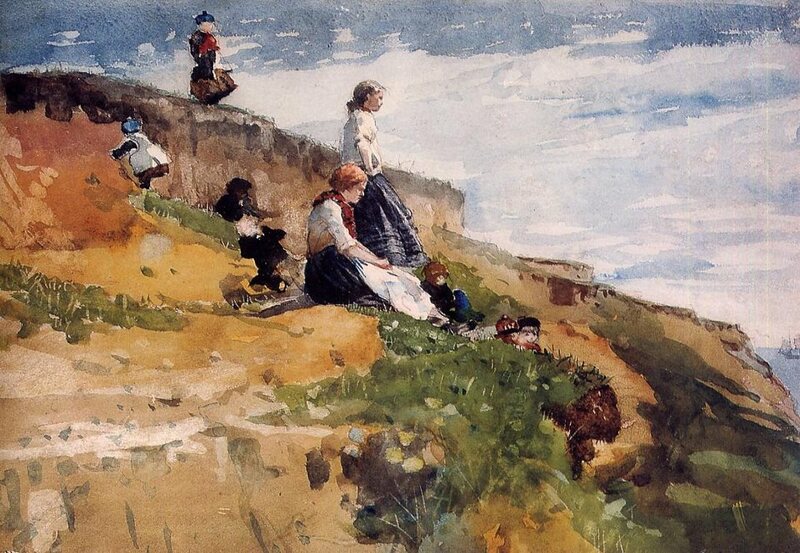 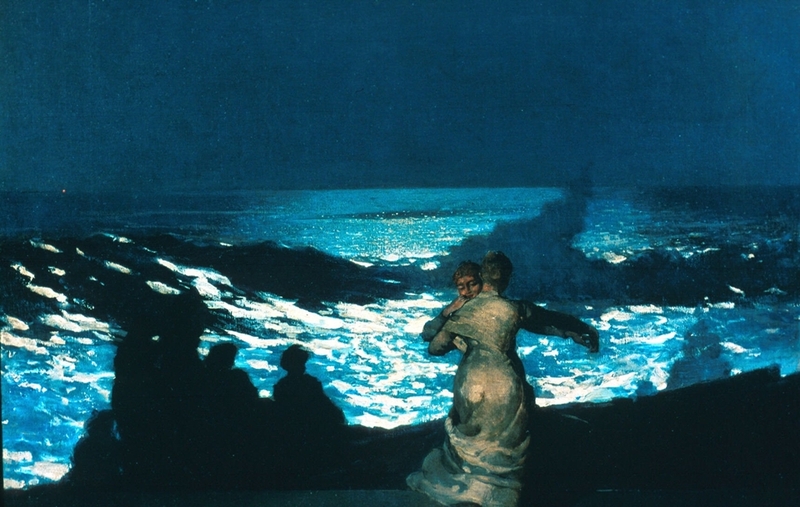 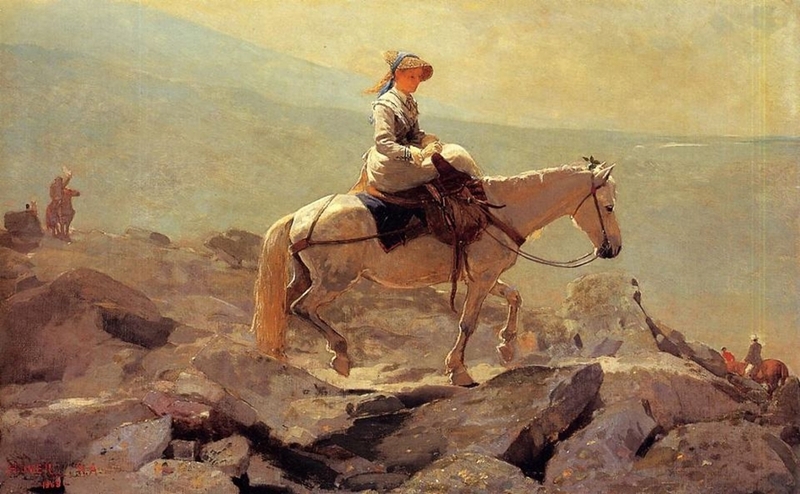 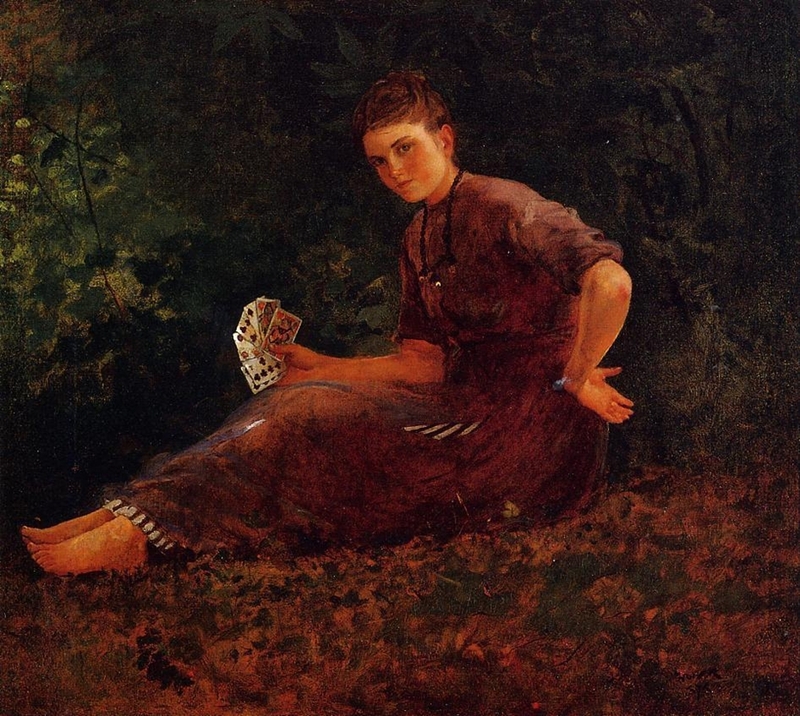 Winslow Homer (1836-1910) is regarded by many as the greatest American painter of the nineteenth century. 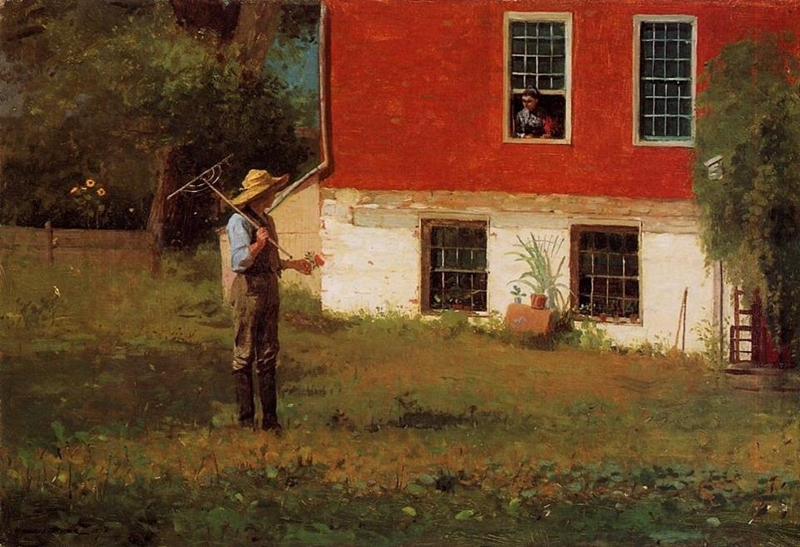 Born in Boston and raised in rural Cambridge, he began his career as a commercial printmaker, first in Boston and then in New York, where he settled in 1859. 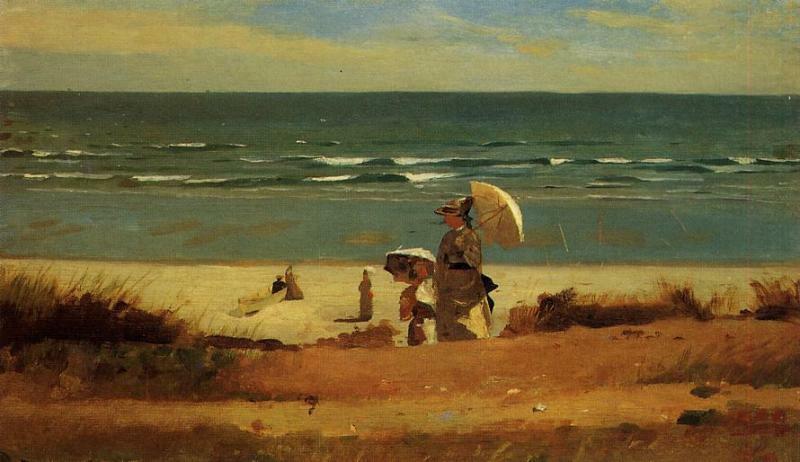 He briefly studied oil painting in the spring of 1861. 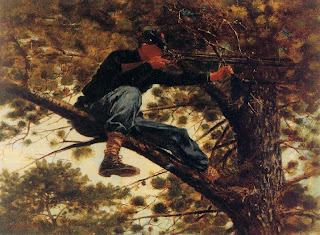 In October of the same year, he was sent to the front in Virginia as an artist-correspondent for the new illustrated journal, Harper's Weekly. 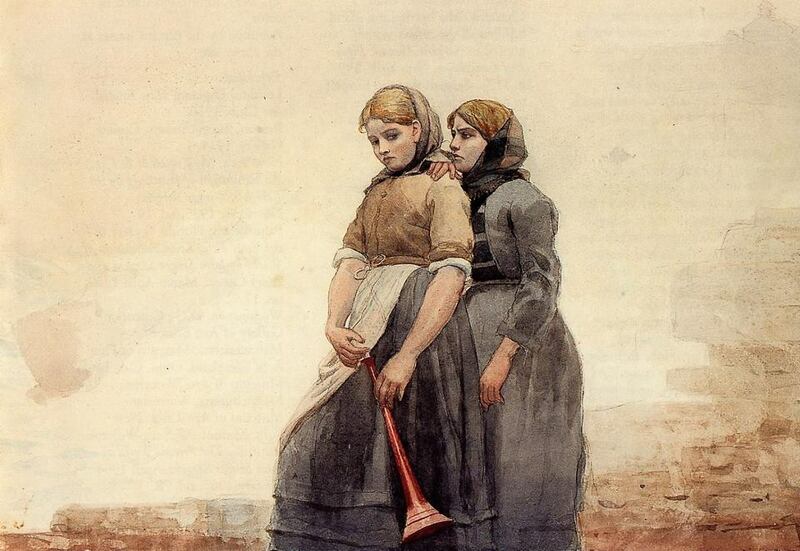 Homer's earliest Civil War paintings, dating from about 1863, are anecdotal, like his prints. 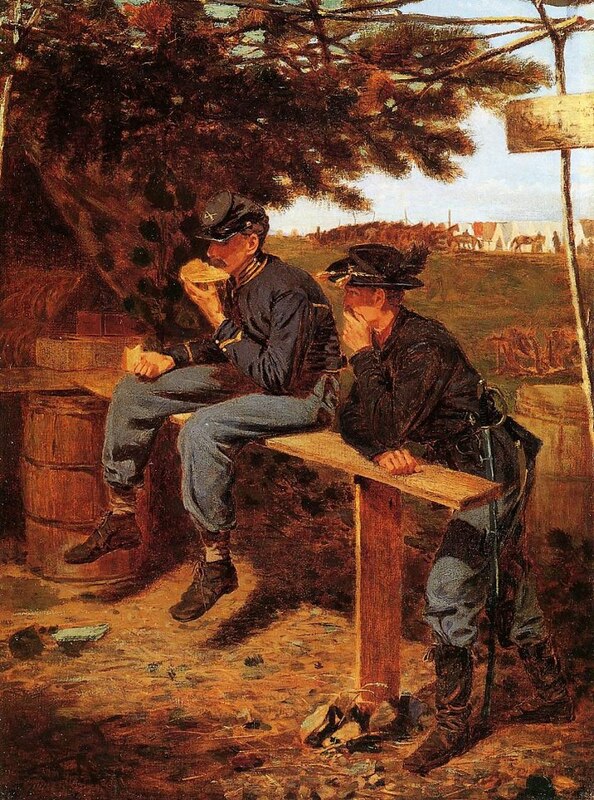 As the war drew to a close, however, such canvases as The Veteran in a New Field and Prisoners from the Front reflect a more profound understanding of the war's impact and meaning. 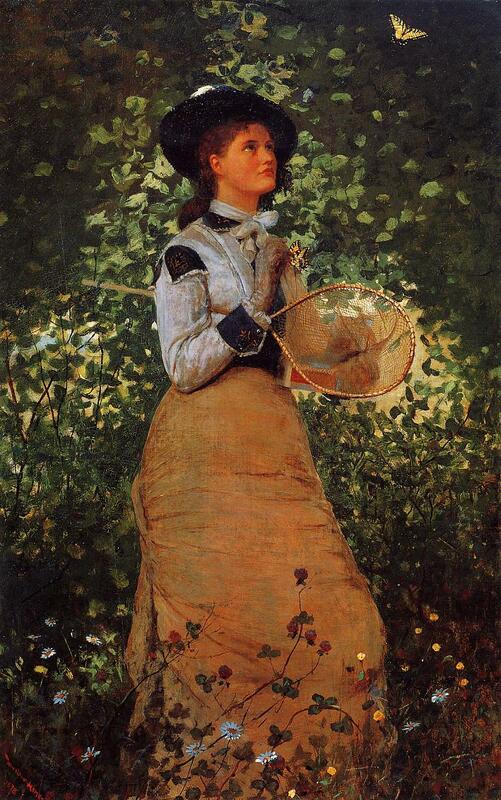 For Homer, the late 1860s and the 1870s were a time of artistic experimentation and prolific and varied output. 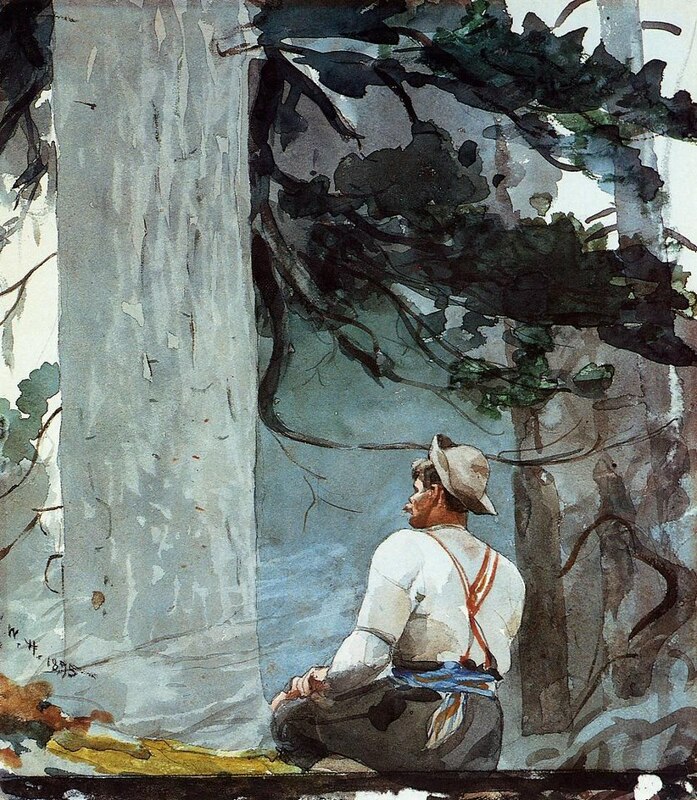 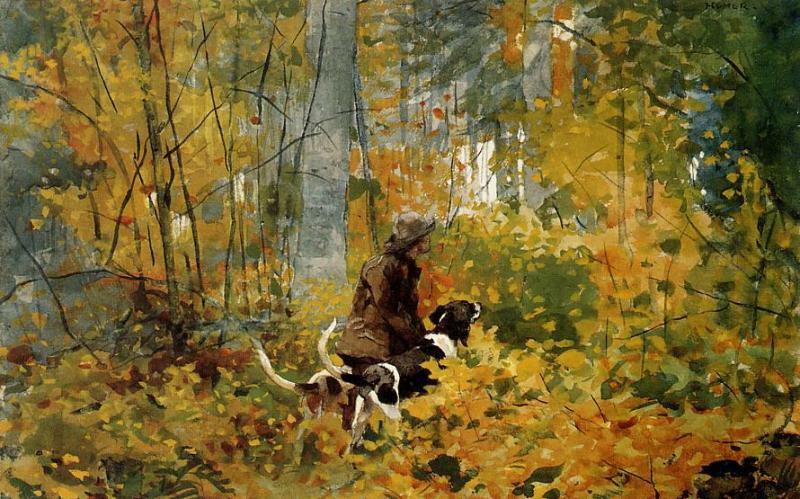 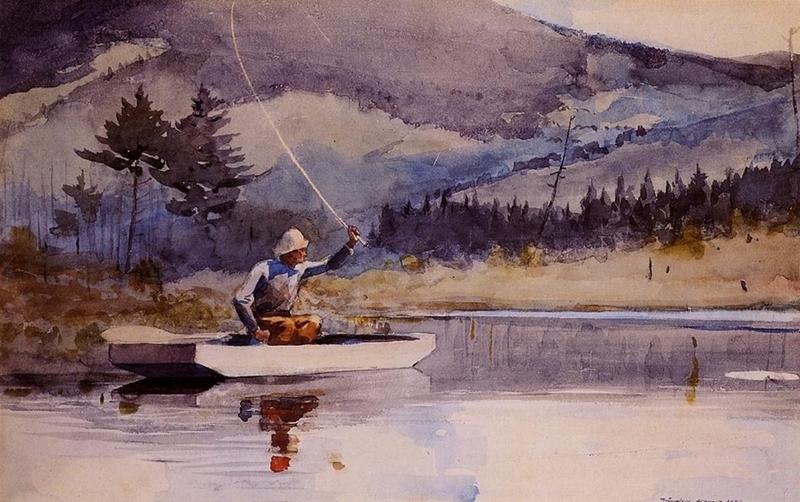 He resided in New York City, making his living chiefly by designing magazine illustrations and building his reputation as a painter, but he found his subjects in the increasingly popular seaside resorts in Massachusetts and New Jersey, and in the Adirondacks, rural New York State, and the White Mountains of New Hampshire. 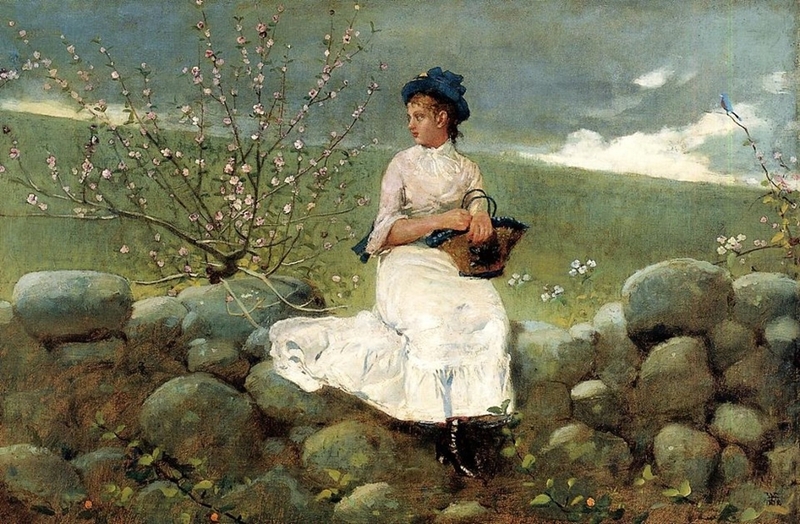 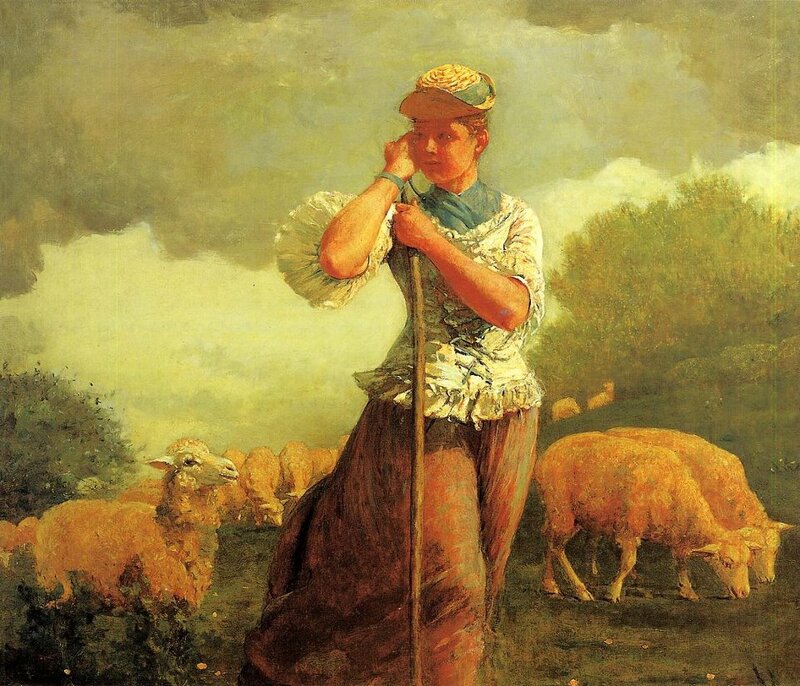 Late in 1866, motivated probably by the chance to see two of his Civil War paintings at the Exposition Universelle, Homer had begun a ten-month sojourn in Paris and the French countryside. 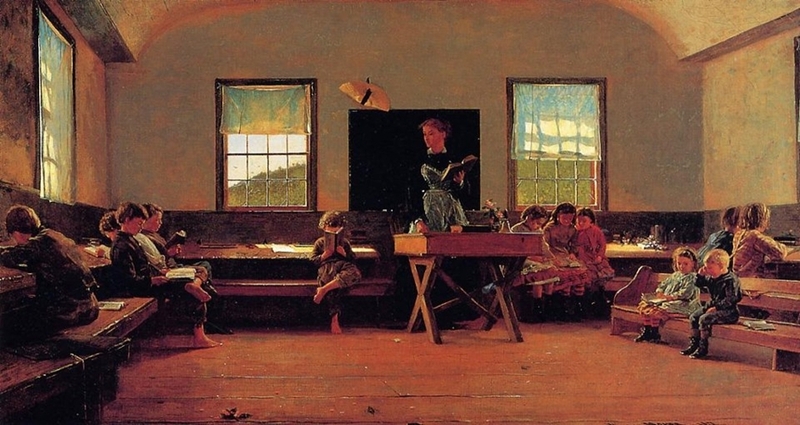 While there is little likelihood of influence from members of the French avant-garde, Homer shared their subject interests, their fascination with serial imagery, and their desire to incorporate into their works outdoor light, flat and simple forms (reinforced by their appreciation of Japanese design principles), and free brushwork. 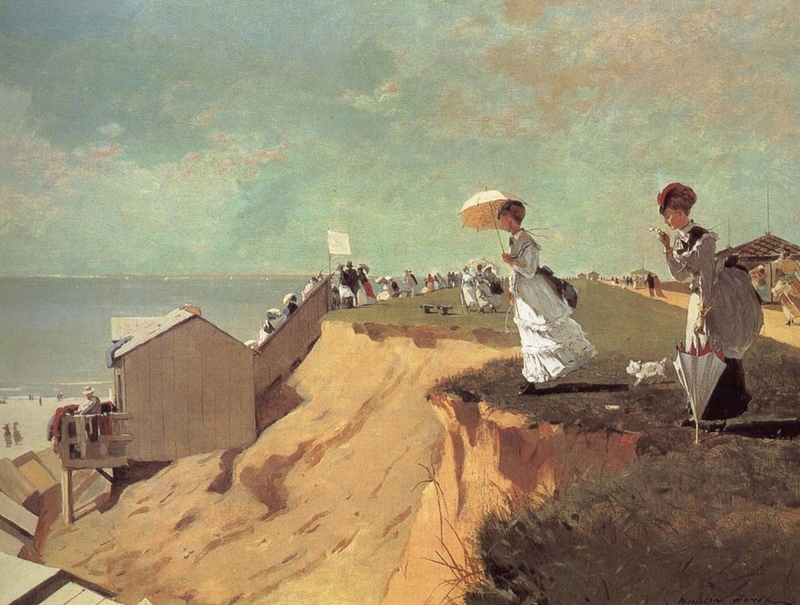 Women at leisure and children at play or simply preoccupied by their own concerns were regular subjects for the artist in the 1870s. 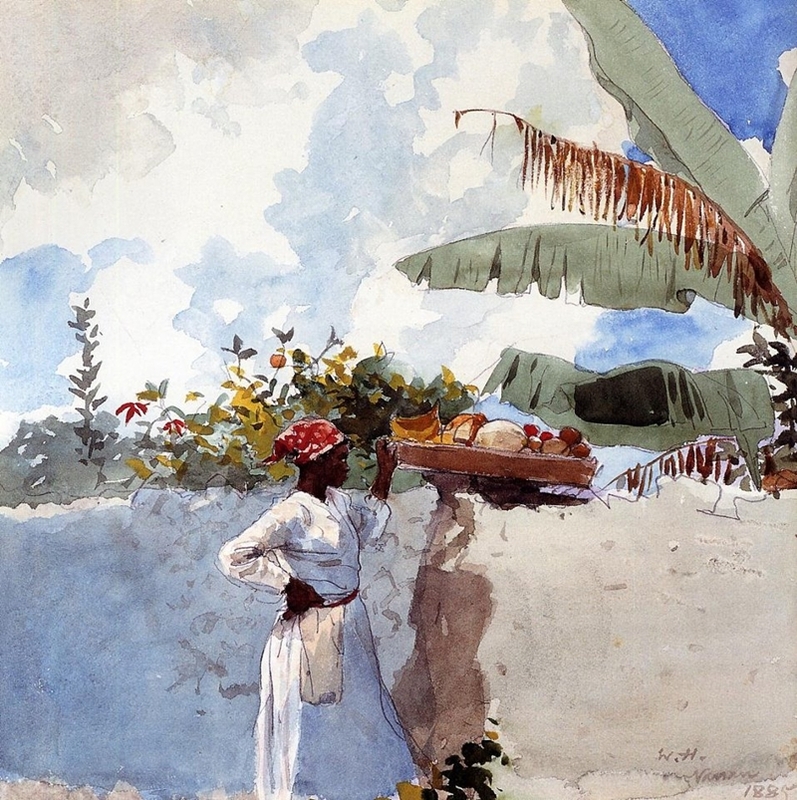 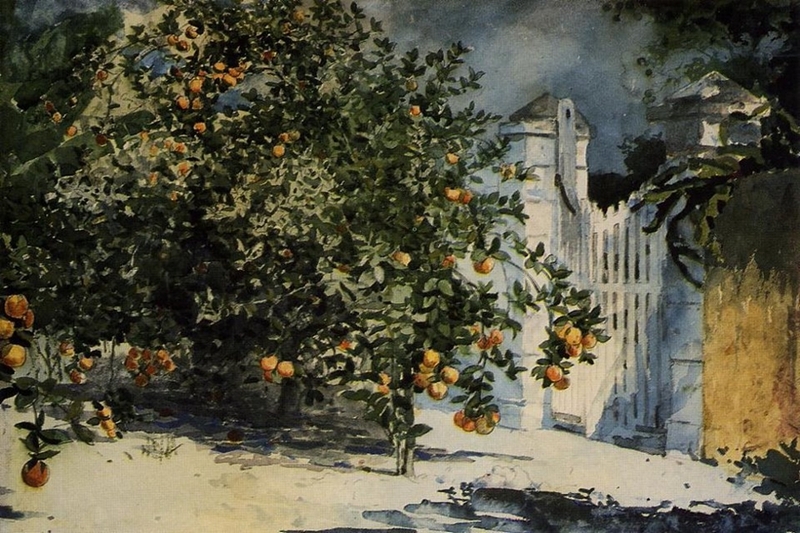 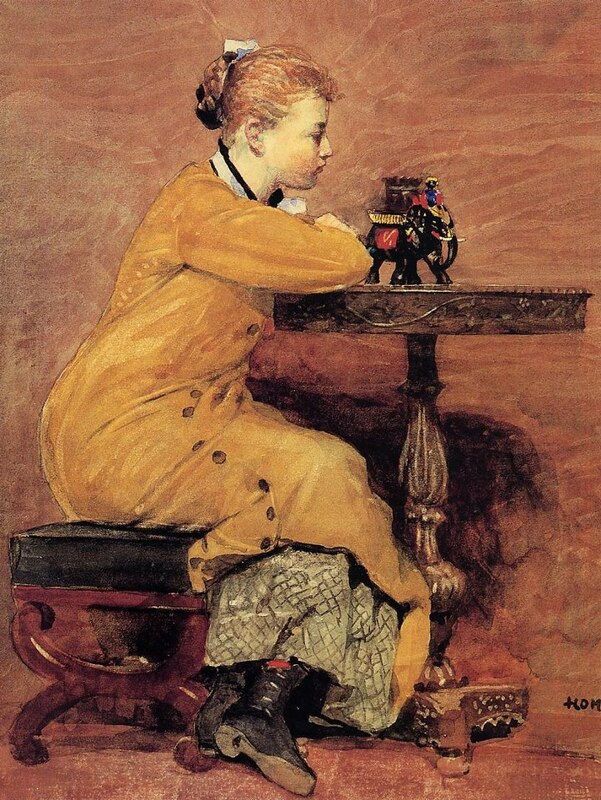 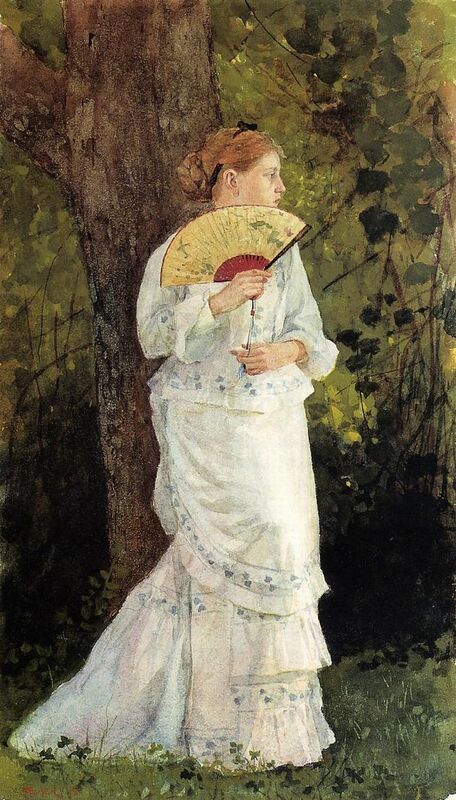 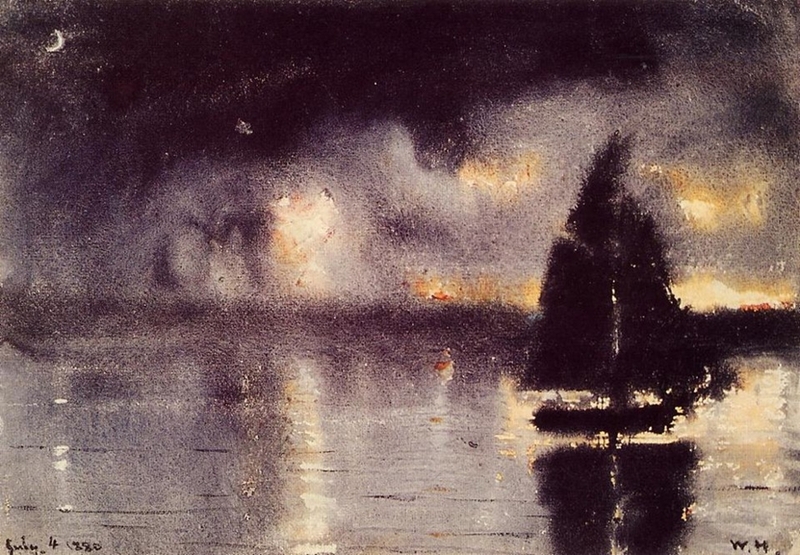 In addition to expanding his mastery of oil paint during that decade, Homer began to create watercolors, and their success enabled him to give up his work as a freelance illustrator by 1875. 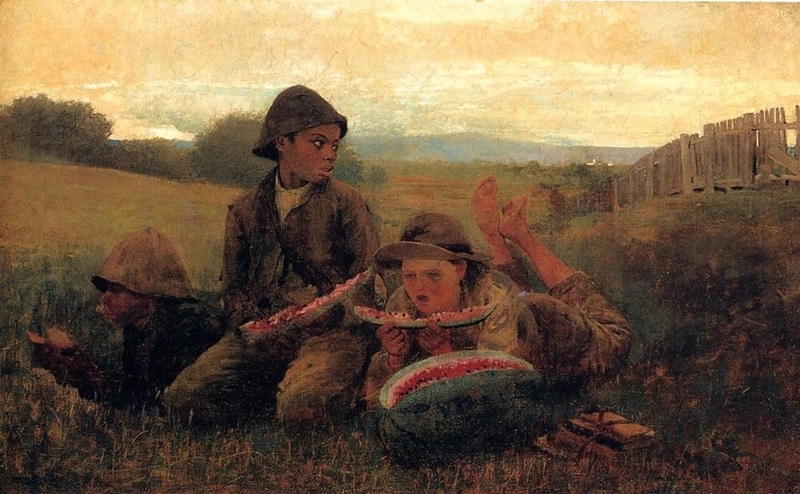 He had been in Virginia during the war, and he returned there at least once during the mid-1870s, apparently to observe and portray what had happened to the lives of former slaves during the first decade of Emancipation. 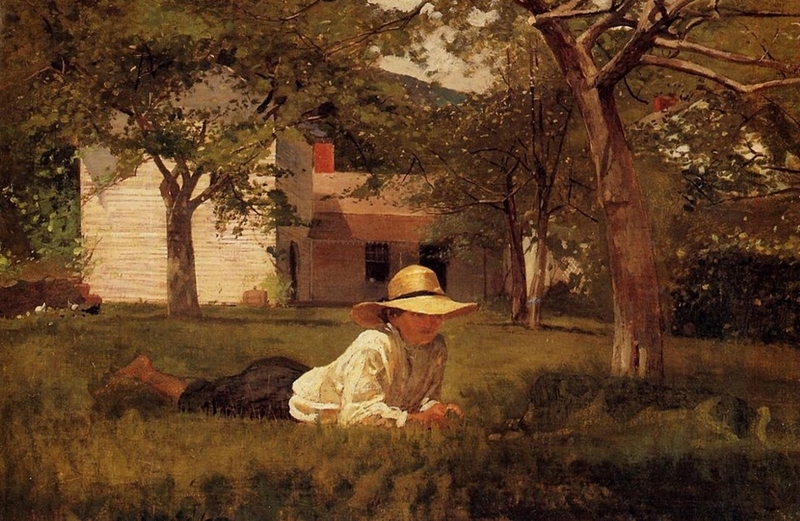 In the early 1880s, Homer came increasingly to desire solitude, and his art took on a new intensity. 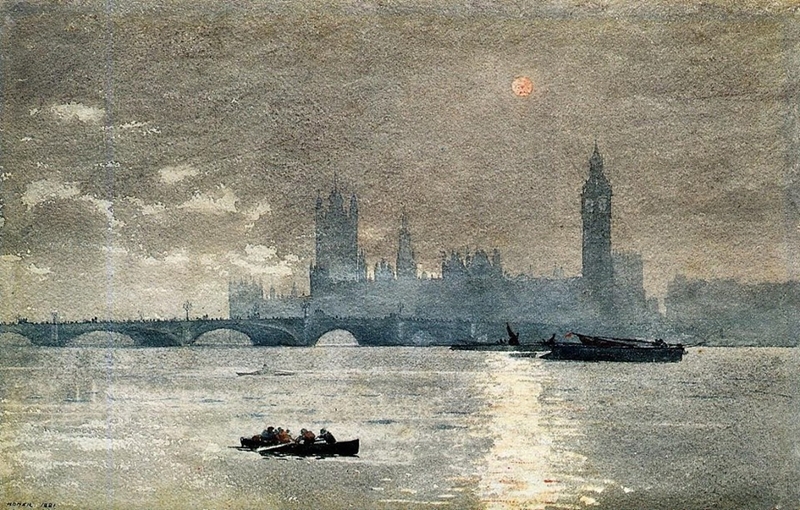 In 1881, he traveled to England on his second and final trip abroad. 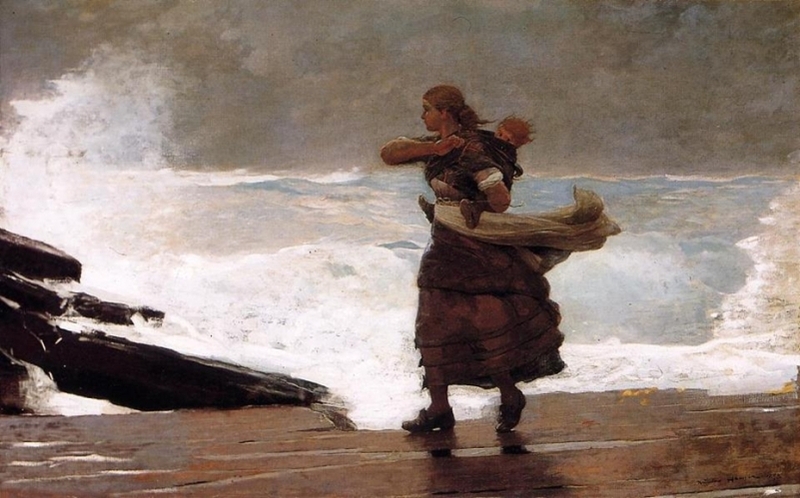 After passing briefly through London, he settled in Cullercoats, a village near Tynemouth on the North Sea, remaining there from the spring of 1881 to November 1882. 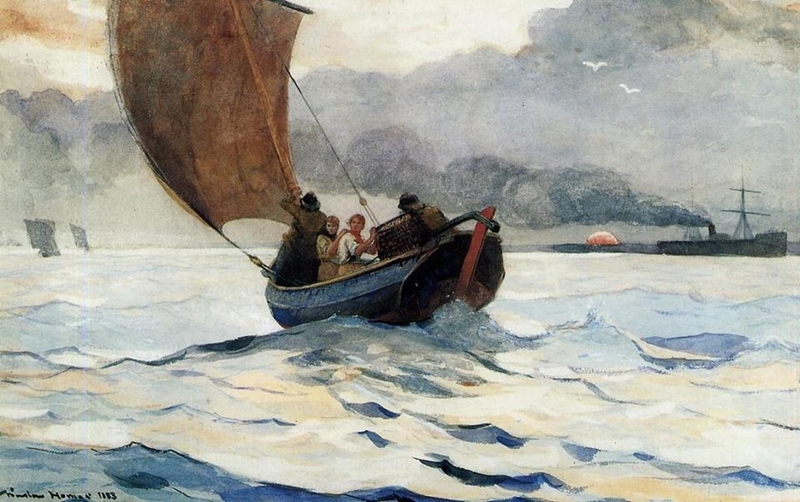 He became sensitive to the strenuous and courageous lives of its inhabitants, particularly the women, whom he depicted hauling and cleaning fish, mending nets, and, most poignantly, standing at the water's edge, awaiting the return of their men. 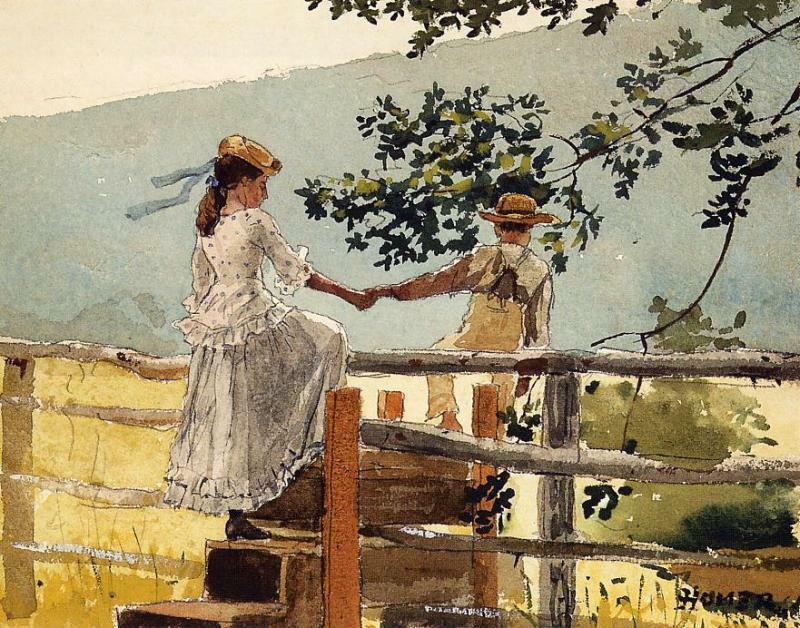 When the artist returned to New York, both he and his art were greatly changed. 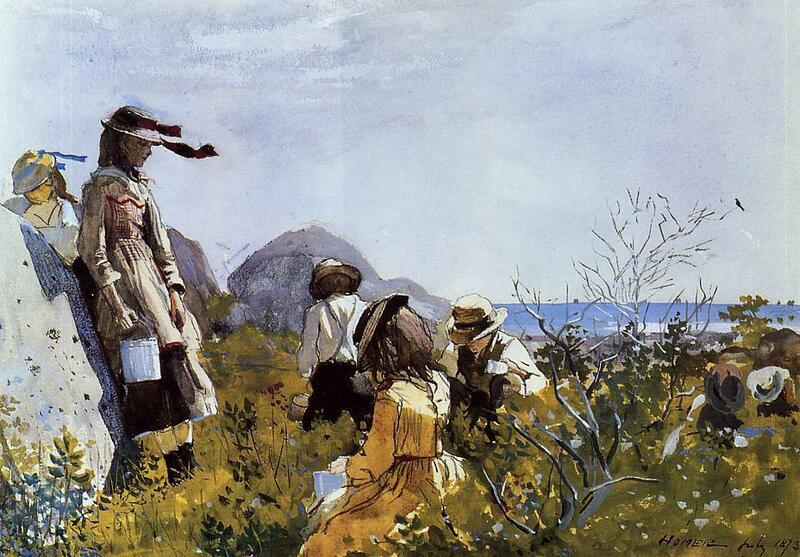 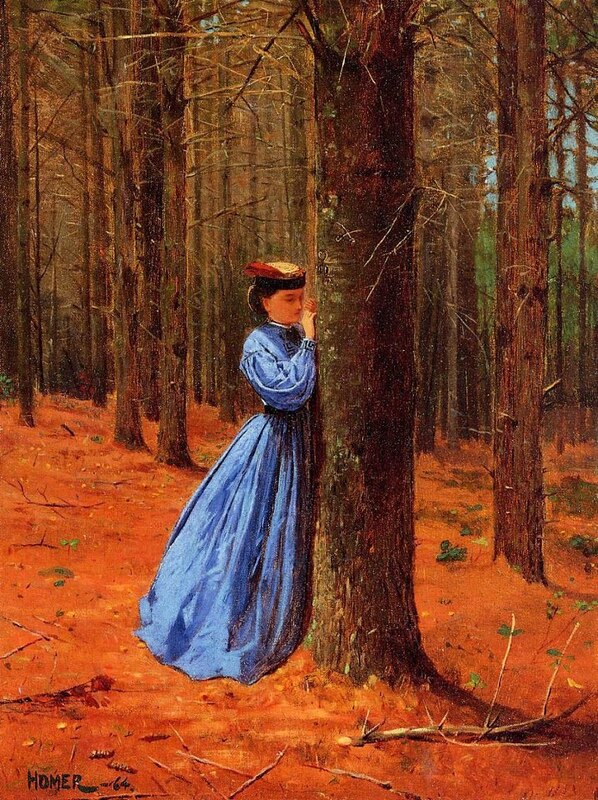 In the summer of 1883, Homer moved from New York to Prout's Neck, Maine, a peninsula ten miles south of Portland. 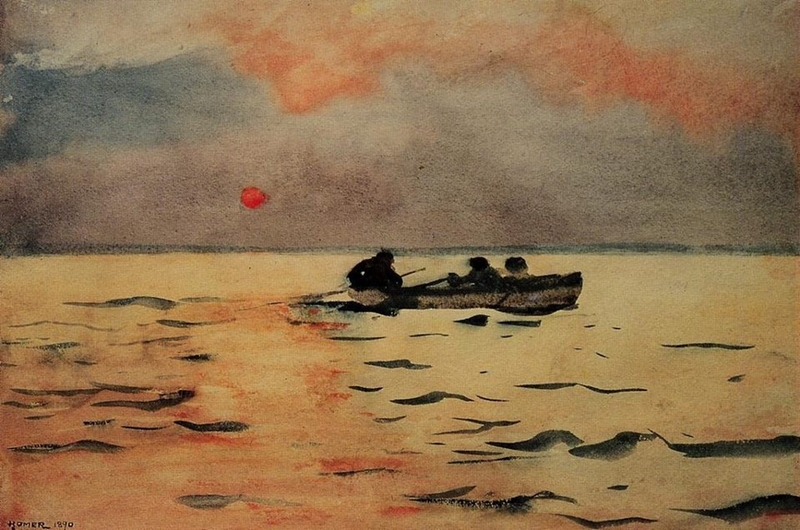 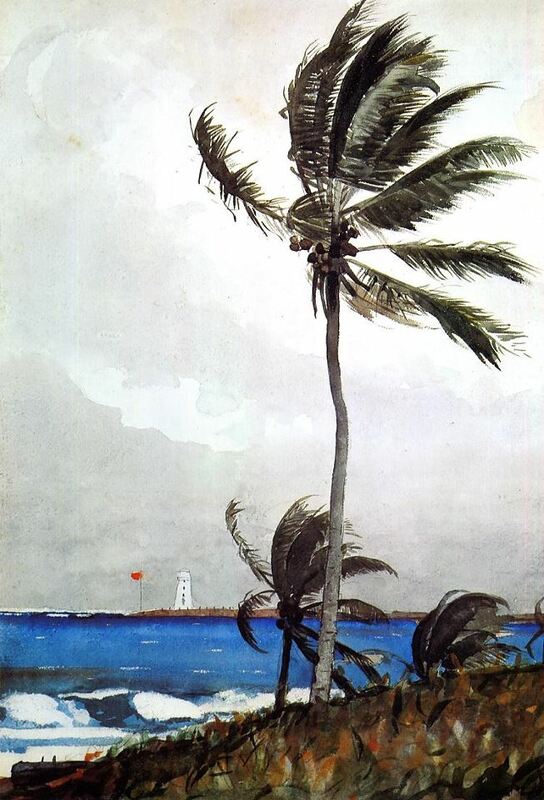 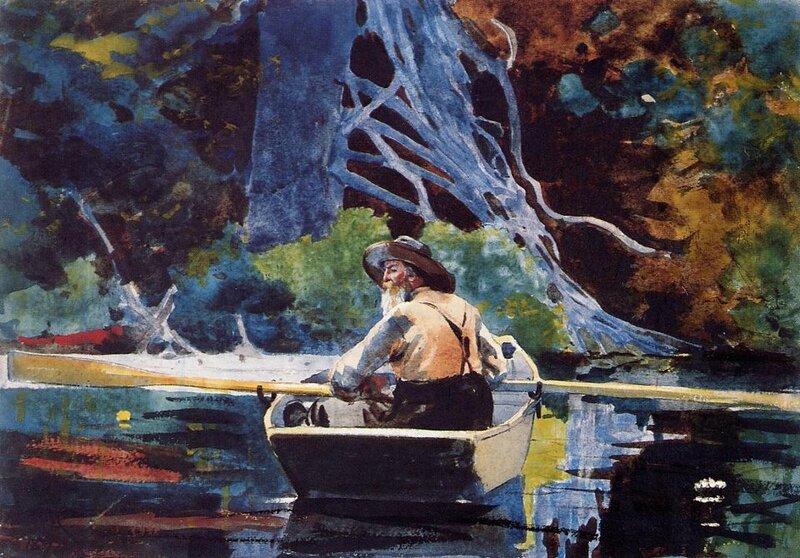 Except for vacation trips to the Adirondacks, Canada, Florida, and the Caribbean, where he produced dazzling watercolors, Homer lived at Prout's Neck until his death. 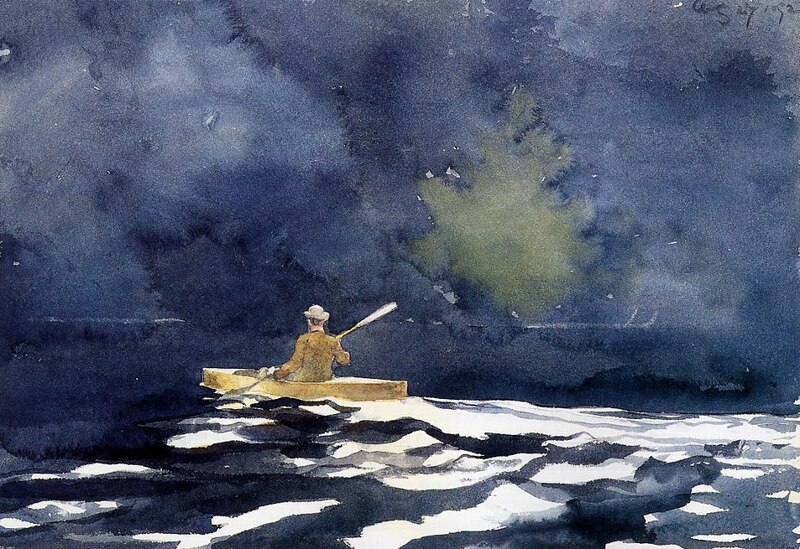 He enjoyed isolation and was inspired by privacy and silence to paint the great themes of his career: the struggle of people against the sea and the relationship of fragile, transient human life to the timelessness of nature. 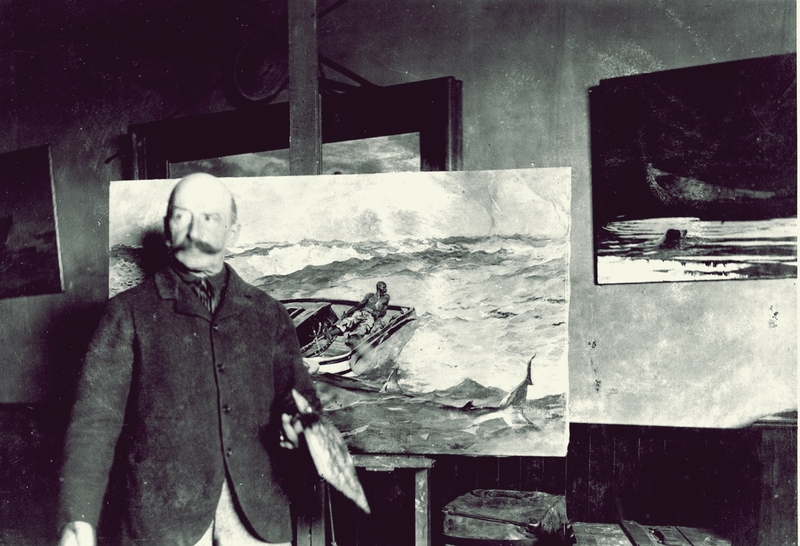 In ambitious works of the 1880s, men challenge the ocean's power with their own strength and cunning or respond to the ocean's overwhelming force in scenes of dramatic rescue. 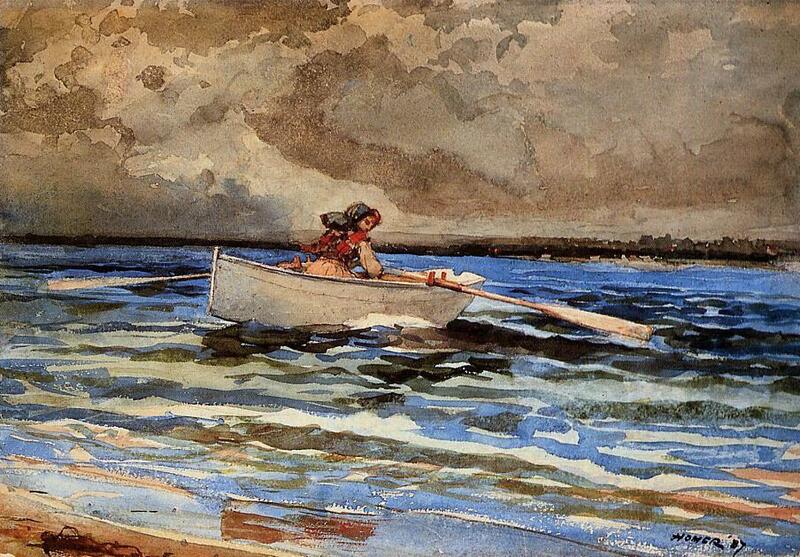 By about 1890, however, Homer left narrative behind to concentrate on the beauty, force, and drama of the sea itself. 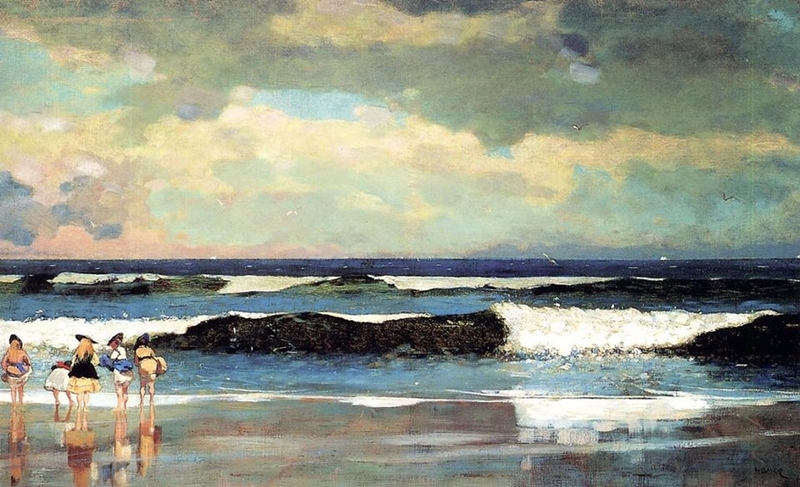 In their dynamic compositions and richly textured passages, his late seascapes capture the look and feel (and even suggest the sound) of masses of onrushing and receding water. 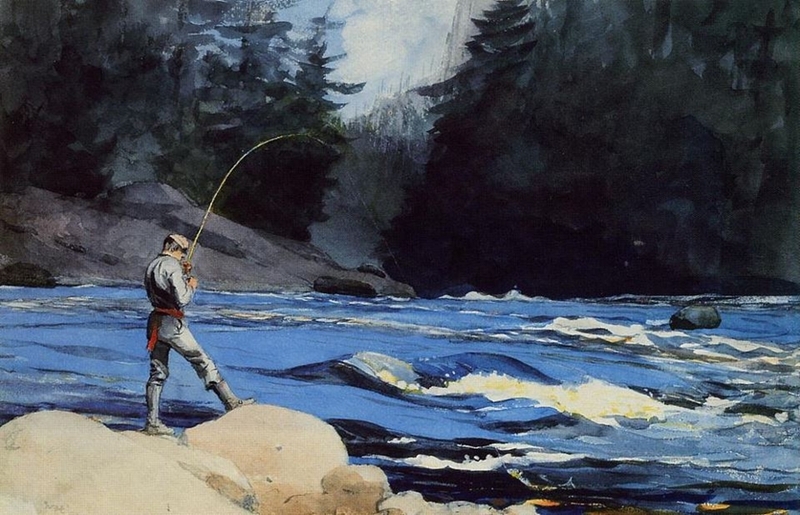 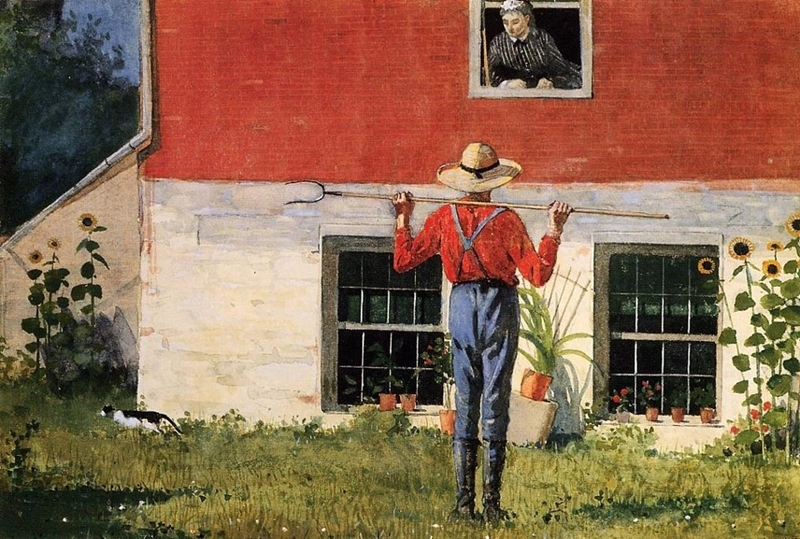 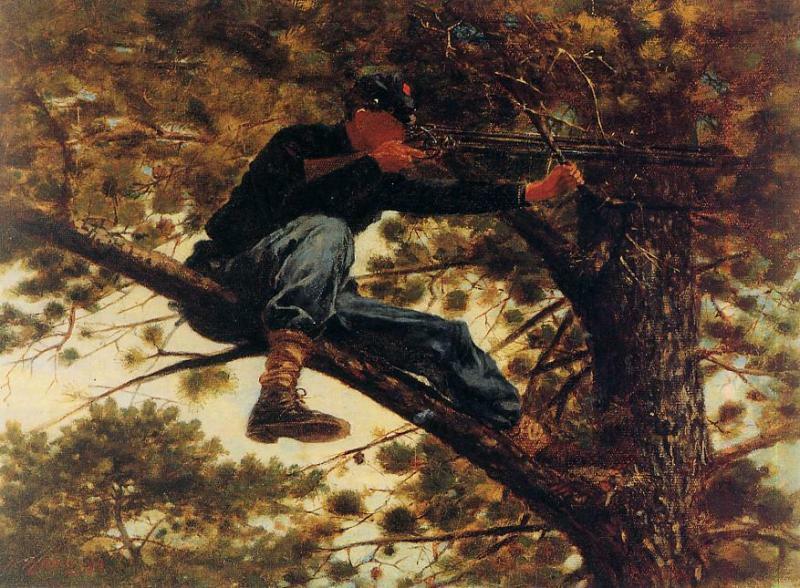 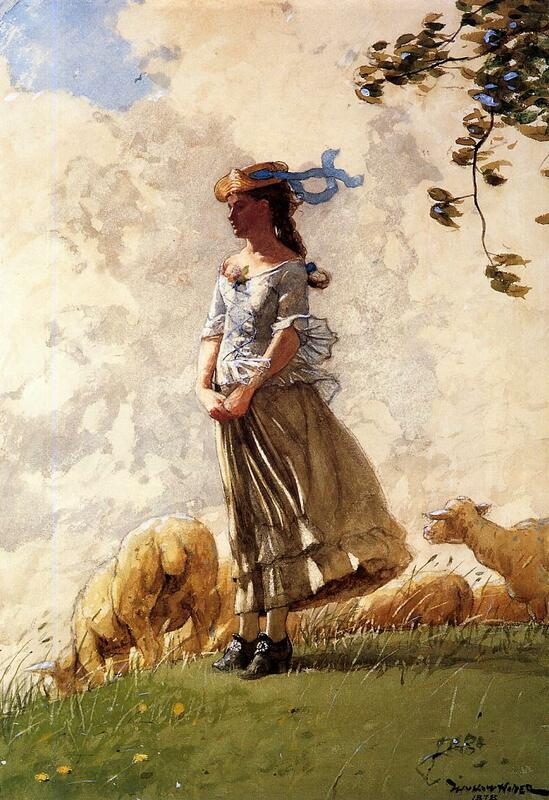 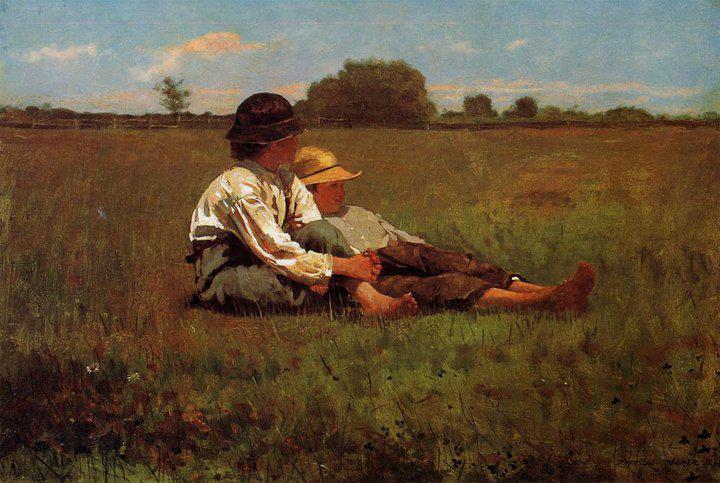 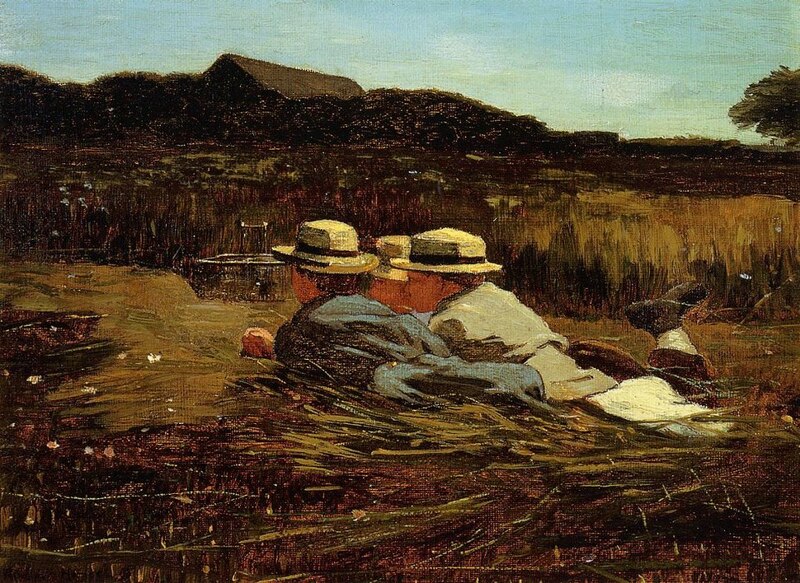 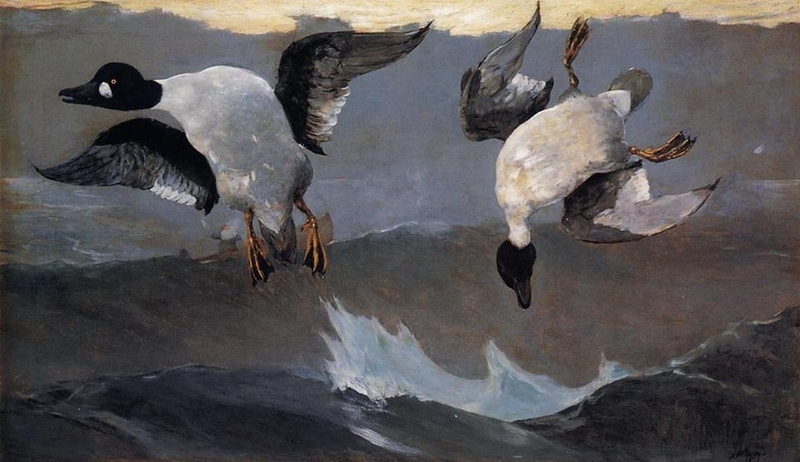 Homer, Winslow - Pittore, nato il 24 febbraio 1830 a Boston (Massachusetts), morto il 29 settembre 1910 a Scarboro (Maine). 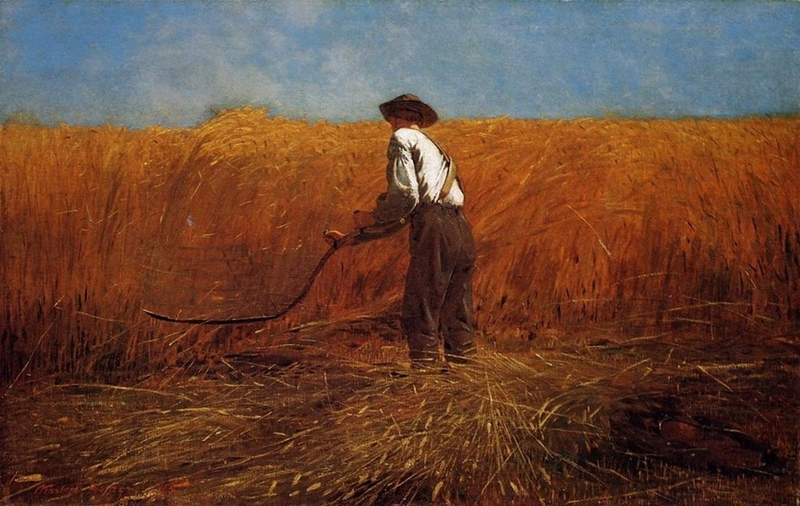 Come molti pittori americani non ricevette insegnamento artistico. 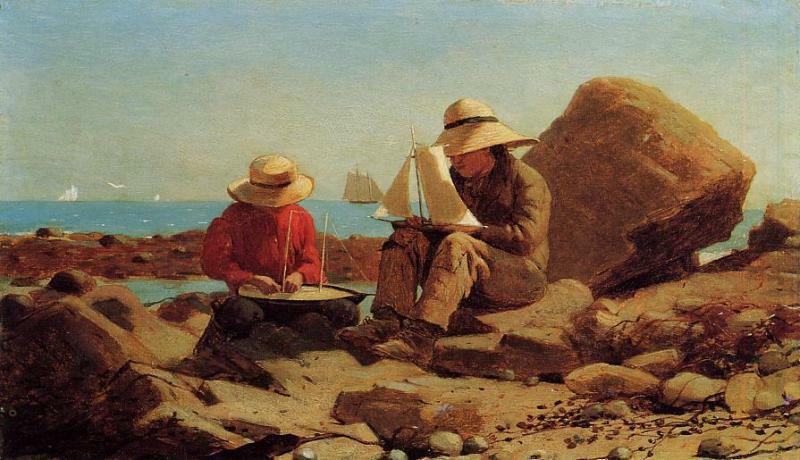 Dal 1854 al 1856 lavorò col litografo Bufford. 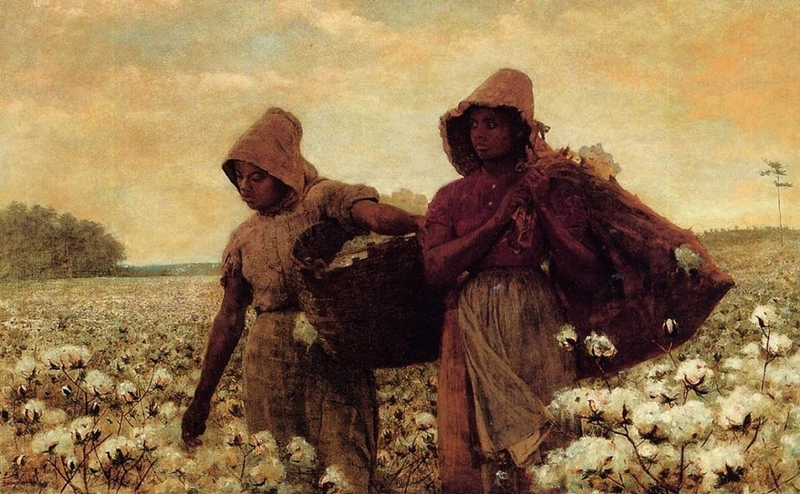 Cominciò poi a lavorare per la rivista Ballou's Monthly e per i fratelli Harper. 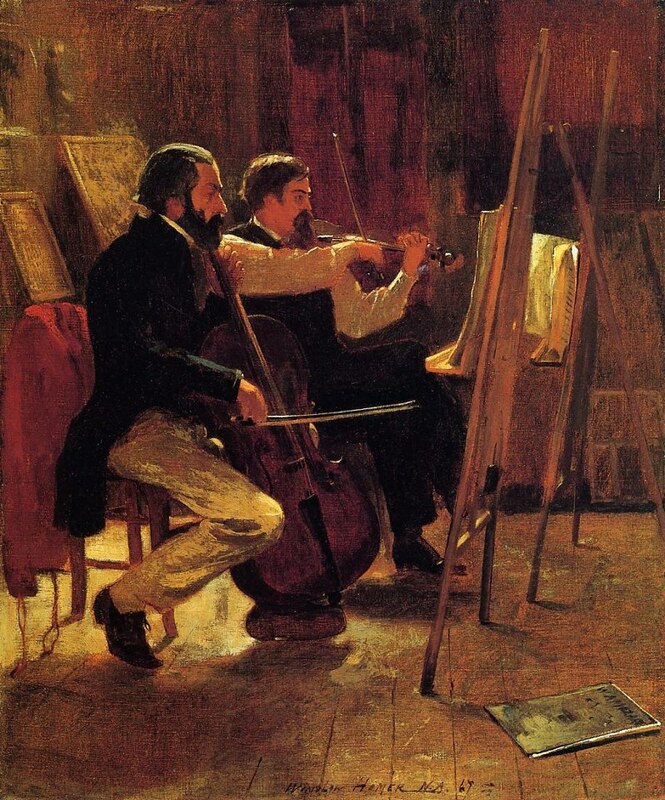 Giunto per la prima volta a New York nel 1859, frequentò per alcune settimane la classe serale dell'Accademia del disegno. 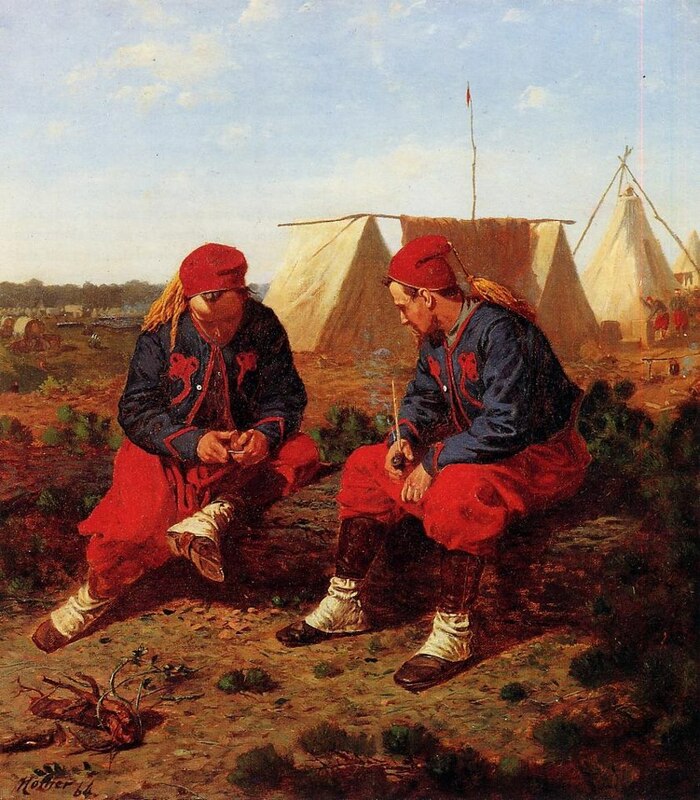 Eseguì studî e bozzetti della guerra civile, e infatti le prime pitture che lo resero noto sono scene di vita militare (Sharpshooter on picket duty; Prigionieri, 1866, ecc. 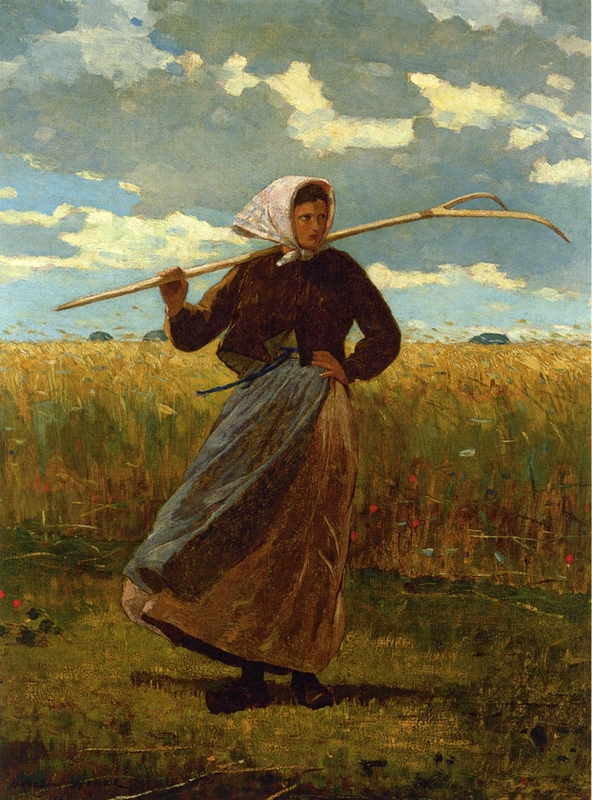 ); ma, nonostante il rapido successo, il pittore si sviluppò lentamente, sicché le sue opere più importanti furono eseguite dopo i 40, e molte dopo i 50 anni. 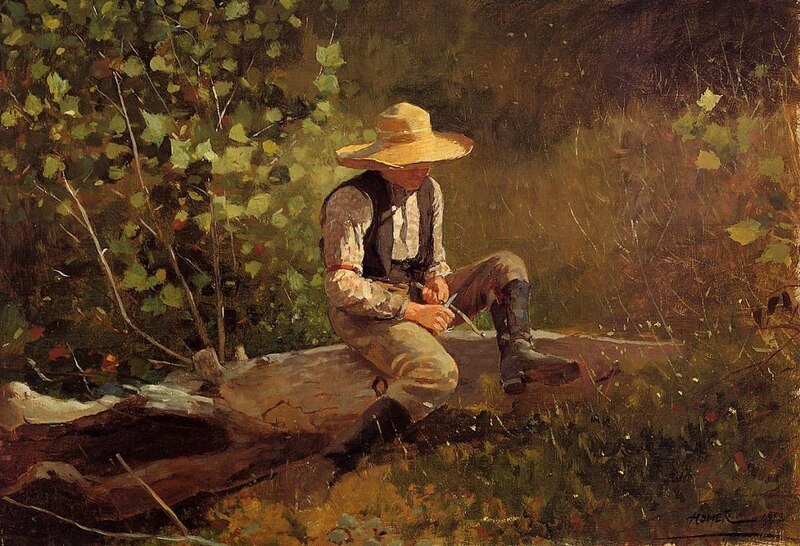 Originale e indipendente, fondava la sua arte sull'immediatezza della sua visione. 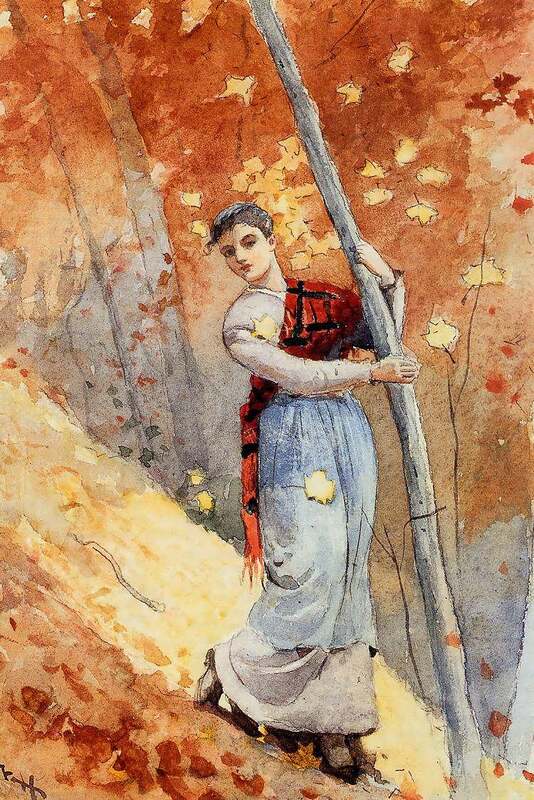 J'aime beaucoup et je ne connaissais pas le nom de cet artiste !